However, it doesn’t work that way with unethical car dealers and car buyers. It always has been “caveat emptor”, or “buyer beware when it comes to buying or servicing a car. Unfortunately for a buyer to “beware” he must be “aware” …that is to say educated, mature, sophisticated and experienced. This excludes a very large segment of our population including the very young, the very old, the uneducated, those with low I.Q.’s and those not proficient in the English language. This is one reason why our regulators and elected politicians don’t seem to care or act with respect to the rampant unfair and deceptive sales practices of a large number of Florida car dealers? Most elected officials and regulators are lawyers and are highly educated and sophisticated. They don’t have a problem buying or servicing a car. In fact, the car dealer that tries to take advantage of a lawyer, regulator, or politician is asking for trouble. I’ve been writing this column/blog and broadcasting my radio show, Earl Stewart on Cars, for about eight years. I sometimes feel that I’m “preaching to the choir” when it comes to advising people how to avoid getting ripped off by a car dealer. You, my readers and listeners, largely fall into the category of the educated and sophisticated, “aware” buyer. Most of you aren’t taken advantage of when you buy or service your car because you won’t allow it. Unfortunately, there are enough uneducated, naive, and otherwise vulnerable consumers to feed those unethical car dealers who prey on the defenseless among us. All you must do is read some of the car ads online or watch some on TV. To the educated, sophisticated buyer, these ads are funny, if you can forget the fact that so many fall prey to them and are taken advantage of by the dealers. For example, it’s hard for you or me to believe that anybody would respond to an advertisement without reading the fine print. Many dealers today are advertising prices that, when you read the fine print, are understated by many thousands of dollars. When you or I see a dealer stating that the car price is plus “freight”, we are educated enough to understand that the law requires that the freight cost be already included in the price. A shrewd buyer knows that “dealer list” is not the same thing as MSRP and that a large discount from “dealer list” means absolutely nothing. We know that the “lowest price guarantee” is worthless if the dealer reserves the right to buy the car from the other dealer that offers a lower price. There are those who argue that all buyers have the responsibility to guard against unethical sellers, to take care of themselves. In fact, that’s the literal translation of the Latin legal term “caveat emptor”…let the buyer beware. That’s sounds good, but what about the elderly widow whose husband recently died and who never had to make the decision on a major purchase in her entire life? What about the young person just out of school with no experience in the real world? How about the immigrant who struggles with English? Should we be concerned about our underprivileged classes who often drop out of school because they must go to work to support themselves or their family? You and I know lots of good people who, for one reason or another, simply can’t cope with a slick car or service salesman. As I’m sure you know, the flooding from hurricane Harvey in Houston and surrounding areas was unprecedented and catastrophic; over 50 inches of rain fell which was the second highest on record in the USA (51 inches once fell Hawaii). About a MILLION cars were “destroyed”. Our most recent hurricane, Irma, caused very little flood damage compared to Harvey. When I say “destroyed”, you may envision a vehicle badly and visibly damaged, but most of these cars caught in the flood look good. Most of the damage and signs of damage are hidden. Many of these cars are brand new. The cars that you see in the aerial picture above are all “destroyed” or totaled by the insurance companies, but lots of them will end up on car dealers’ lots for sale…many in South Florida. South Florida is a magnet for “problem” cars. Problem cars are those that aren’t supposed to be sold or that can be hard to sell. For example, cars missing airbags, cars with un-repaired dangerous recalls (Takata airbags), totaled cars that were rebuilt, cars with very high mileage that have had their odometers replaced with lower miles, and, of course flood cars. (1) It’s the second largest volume retail car market in the world, next to southern California. (2) South Florida exports more new and used cars (mainly to Central and South America) than anyplace else. Other countries have very lacks safety regulations compared to the USA. (3) More car dealers in South Florida rank below the already low average of honesty and ethics for car dealers (Google “Gallup Annual Poll for Honesty and Ethics in Professions”). (4) Florida regulators and legislators are more lax than most other states in the enforcement of rules and laws controlling the bad behavior of car dealers. · Inspect the carpets to see if they show signs of having been waterlogged, such as smelling musty or having caked-on mud. Likewise, brand-new carpets in an older vehicle may be another red flag. · Check the seat-mounting screws to see if there is any evidence that they have been removed. To dry the carpets effectively, the seats must be removed and possibly even replaced. · Inspect the lights. Headlights and taillights are expensive to replace, and a visible water line may still show on the lens or reflector. · Inspect the difficult-to-clean places, such as gaps between panels in the trunk and under the hood. Waterborne mud and debris may still appear in these places. · Look for mud or debris on the bottom edges of brackets or panels, where it wouldn’t settle normally. · Search around the engine compartment. Water lines and debris can appear in hard-to-clean places, such as behind the engine. · Look at the heads of any unpainted, exposed screws under the dashboard. Unpainted metal in flood cars will show signs of rust. · Check to see if the rubber drain plugs under the car and on the bottom of doors look as if they have been removed recently. That may have been done to drain floodwater. You should know, that the some of the crooks that sell these cars also read Consumer Reports and can successfully disguise many of the signs you read above. As with computer hackers and the anti-virus companies, there’s a seesaw battle staying ahead of each other. For this reason, I suggest that you insist on a CarFax or AutoCheck report and take the car you’re proposing to buy to a mechanic you can trust. For about $100 he can do a thorough check on your car…money well spent. 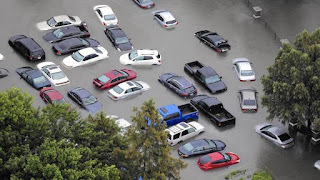 Another precaution you should take is simply don’t buy a car that was titled in the Texas flood area during the time of hurricane Harvey. However, remember that titles can be “washed” and this means some states will allow a new title to be issued on a car that erases all evidence of its previous history. The three worst states are Mississippi, New Jersey, and Pennsylvania. There is no national, federal title law; each state makes up its own. Fortunately for us, Florida has a rigid law, but that protects you only if the car was never titled out of state. If you buy a used car that was sold new in Florida and retitled for new owners only in Florida, you can be sure it wasn’t flood damaged anywhere else. As if that’s not enough to worry about, remember that lots of Texans didn’t have flood insurance and never had their cars repaired even though they were partially submerged. It takes only about 18 inches of water to destroy the electronics in a car. Modern cars are “computers on wheels”. The car can function fine after its initial submersion for weeks and even months. Many of these uninsured cars were quickly traded in or sold outright by their owners. There is no official record on these cars. Your only hope is a thorough inspection by a trusted mechanic.